Or should I say, in this case it might be opposite of what you normally connects with this saying…. In the world of salmon fishing, most fisherman think they definitely have to fish a fly that is BIG enough so NO salmon in the river would miss seeing it, when it swings across….. that is probably the worst mistake ever done by a fisherman, and probably one of the reasons why sinking lines have become more and more popular, even for summer fishing. If we think about salmon and how they feed in the sea, we just have to look at a calender to see when they are feeding in the sea. They leave the rivers as smolts in the month of May, growing up feeding over the autumn and winter in the North Atlantic, where there’s more dark hours than light. Still they are capable of finding the food they need, krill, shrimps or what ever they feed on, rather small prey to see and catch in the dark, still they’re believed to have difficulties seeing a fly on a bright summers day in a shallow clear river…… DON’T WORRY, they see EVERYTHING….. 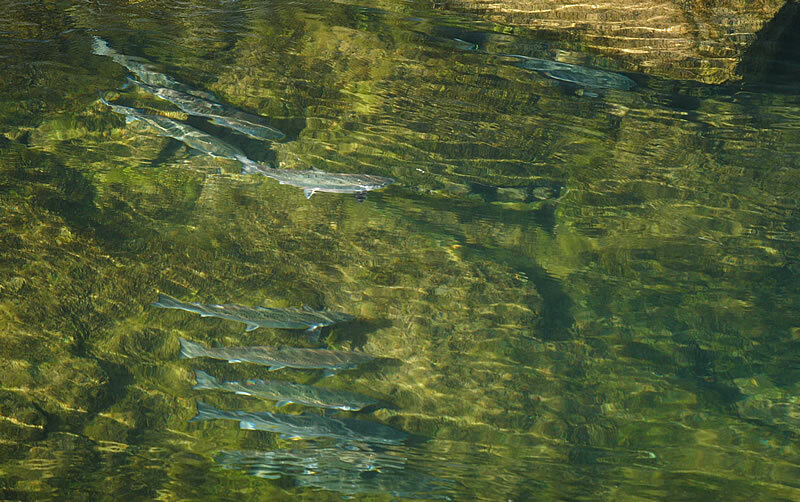 I have had the opportunity to study salmon and their behavior during 10 years in crystal clear rivers in Iceland. 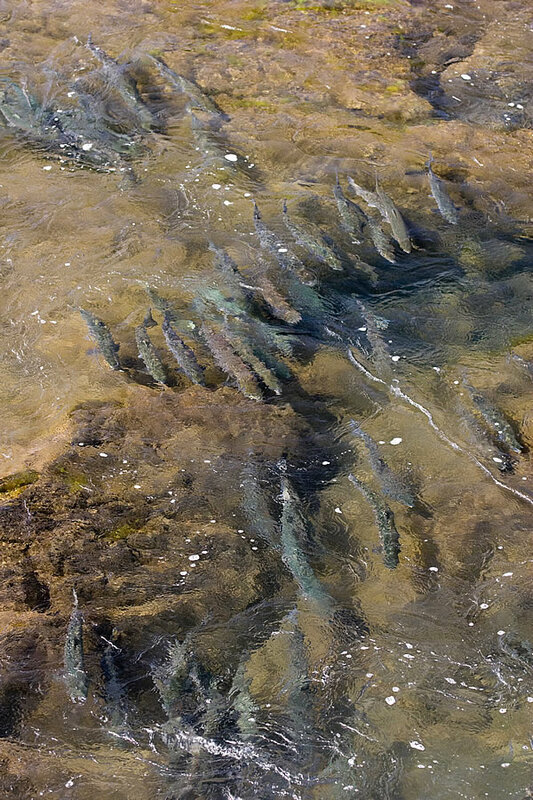 These rivers have a population of fish, of which you can statistically base a reasonably solid experience….. not just the odd salmon here and there, but schools of fish, up to 50 or more. When watching fishermen presenting different flies to these fish, and you can get close enough to actually see what the impact on the fish is, you start realizing how careful you need to be in your choice of fly. Hundreds of times I’ve seen fish go ”stiff” if they’d been exposed to a fly that is to big. By ”stiff” I mean their body becomes stiff and their fins are spread and stretched, like they’re ready to take off, if needed. Once they’ve reached this state, you might as well leave them, because if you keep on fishing over them, no matter what size of the fly you use, the inevitable will happen…. one of the fish will circle the pool, and then everything is spooked for hours… Trust me, I’ve watched fish from as close as 5 feet distance through cracks in a cliff, and my eyesight ain’t that bad…. Well, I know a lot of people will disagree on this subject, and I know that most of these fishermen prefer sinking lines. When fishing a sinking line the fly will be visible for a fish in a much shorter period of time, and the light is lower deeper down compared to a fly fished in the surface or just below the surface. Imagine if you fish a ”public beat” in a Norwegian or Swedish river, with a more or less unlimited number of rods? You will simply not be able to keep track of what flies have been fished and what fish have been rested, if at all. In those cases a sinking line is your only chance, because those fish have been pushed down to the bottom, simply due to over exposure to flies (and maybe a little bit of splashing to), so one could say: ”You need to get down and pick them outta there” because they for sure won’t come up to you…. 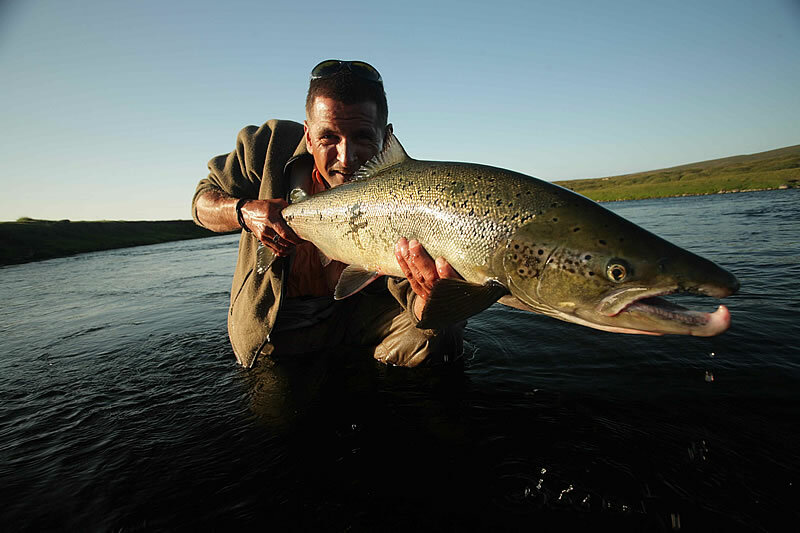 Above mentioned is of course when the water temperatures are high enough in the river, and not in situations when the river is in spate or unusual cold…… But funny enough experiments show from Iceland that some salmon prefer, and will do almost anything to stay in 8C water temperatures…. and still this is, according to the old books, not warm enough to fish a floating line…. It’s quite interesting how various head-lengths and casting style have influenced the size of flies. When I first started fishing in Scotland the size of the fly was a lot smaller than any of the flies fished in the Norwegian rivers I fished the same years. I often wondered if the Scottish salmon eyesight is genetically worse than the Norwegian salmon??? But I doubt it…. The rivers are not that much different in clarity, and almost the same color. Scottish rivers are even darker than most Norwegian rivers, so that does not explain the smaller flies. At the same time the depth are nearly identical, so we can’t immediately just blame it on different conditions. If we look at the traditions in choice of tackle amongst the fisherman on the banks in the countries, there is a dramatic difference in the preferred head-length or belly-length. Traditionally the Scottish fisherman will choose a much longer head/Spey line while the Scandinavian would choose a shorter shooting head. The shorter heads one can cast in wider angles than a longer spey-line (unless you are very very good) and as we all know, casting more across the river will increase the speed on the fly, while the difficulties changing directions with a longer head if you’re close to the bank, forces you to cast more down stream, which makes the fly fish slower. In Norway the fish bigger flies than they traditionally did in Scotland, could the speed automatically influence on what size of fly you could use? I sincerely think so. 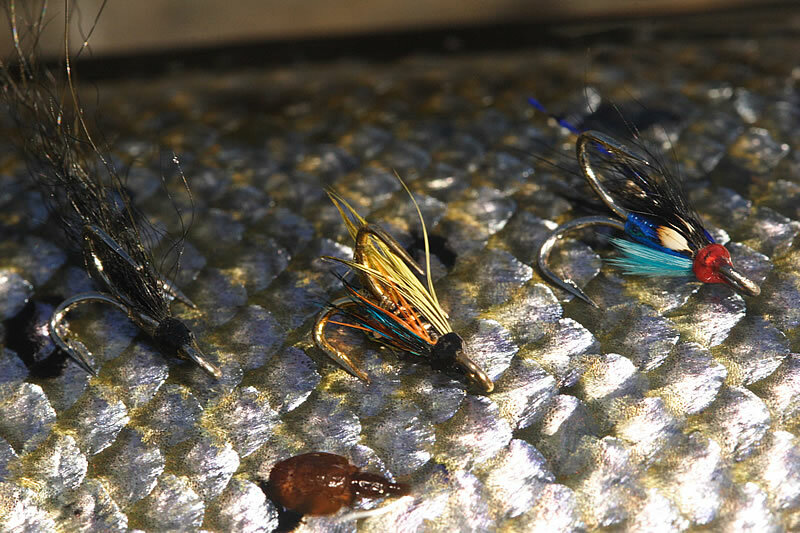 The higher speed – the bigger fly you can use! Over the years I’ve fished in Iceland, I’ve seen a lot of different scenarios, various flies coming and going, of course there’s always the ”Red Francis”, but it is slowly loosing it’s reputation as ”the one and only”. 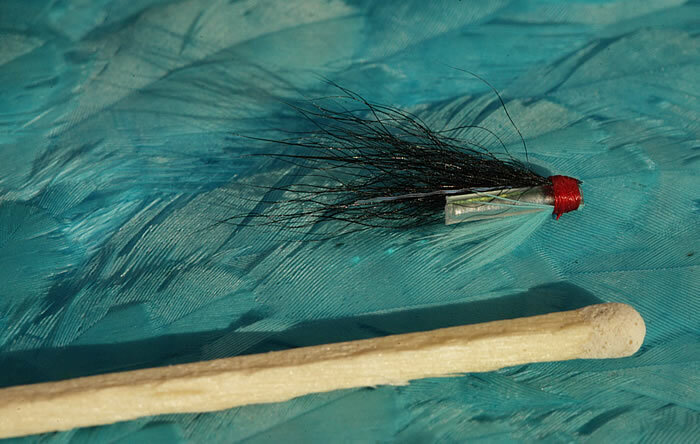 One type of fly that always works is “The Hitch”, either as a tube or as a single hook. It doesn’t matter if the water is 5C and the water level is 3 times higher than normal, it still works! When this is said, you probably don’t even need the flash and the hair, I caught several fish on just the clear plastic tube, because the rest of the materials fell off, but the fish didn’t seem to care…. so why bother changing? Of course the looooong winters must be filled with something else, than just cutting up plastic tubing…. So off I go to the tying wise, I need more SMALL flies, ’cause size does matter…. This fish out of 8 took a look, but never touched the fly….. None of them EVER came back to the flies! Interesting read Klaus. Especially the refusals on heavily hitched flies. I see the same with steelhead; too much surface disturbance means lots of interest from the steelhead but no takes, when you go smaller you get less rises but more solid hook ups. Nice pics too. SVAKALEGA…..góð grein hjá þér Klausi minn!